It was the spring of my ninth year. I was quiet and shy, she was loud and feisty, and I knew from that first meeting that she was destined to be my BFF. For the next sixteen years we were best friends. She was there for the celebrations of my triumphs and the one I turned to for comfort when I was sick, disappointed or nursing a tender heart broken by a careless teenage boy and I was there for her at the end, holding and comforting her as she passed from this world into the next. Her name was Trixie and she was my first Best Fur Friend. Four other dogs have joined my family in the years since Trixie passed on. They have all had unique personalities and endearing quirks that have made them special. 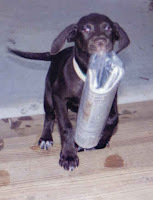 There was Bandit, a sweet, 98 pound Lab mix who never quite figured out that he wasn't a 10 pound puppy. He was terrified of bugs but fearlessly faced down a snake that threatened his mama (that would be me). One of his favorite games was playing in the sprinkler but he refused to step one paw outside at the first sign of rain and he never did get the hang of which leg to lift while standing on the side of a hill. I remember the first time I saw Velvet at the shelter. My husband rubbed his hand across her fur and said she felt just like black velvet. She left us too soon, from cancer, at the age of six but she filled every single day of her six years with love and joy and filled many hearts with precious memories. couple minutes to get the message before she moved on to Plan B, which involved heaving a deep sigh and then flipping the book closed with her paw. She was my loyal friend for 13 years. I guess she figured she had earned the right to make her feelings known! Cassy is a 3-year old Lab/Shepherd mix who adopted me from Project HALO, a wonderful non-profit, no-kill rescue organization in Charlotte, NC. She's a total sweetheart but she's also young, energetic and playful...very playful...which leads me to my current dilemma. Cassy needs a playmate. I've been the playmate of choice since June and though I hold my own pretty well, I'm no match for a young, energetic dog so the search has begun for a another fur friend to join our family. Since most of my dogs have chosen me, I have no idea what breed/color/size our next family member will be but I'm excited to have her, or him, join us! When I first wrote this blog, I had just begun the search for a new fur friend. I knew exactly what I wanted. What I got was exactly what I needed! Rachel, another rescue, came to us from a local rescue organization in the town where I live. She had been abandoned and was in pretty sorry shape when she was found and taken to a county shelter in another part of the state. Luckily for her, and me, the woman who runs the rescue group heard about her, adopted her from the shelter in the nick of time (she was scheduled to be euthanized) and nursed her back to health. She had just been put up for adoption the week before I started looking. I can't imagine our lives without her. She and Cassy are best friends and she fits right into our little family as if she'd always been a part of it. 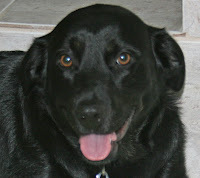 Sweet, friendly, cuddly and totally a "mama's girl," she brings smiles to my face and joy to my heart every day. Tell me about your pets. Are they fur friends? Feathered friends? Or, perhaps, your BFF is of a more exotic variety. Did you find them or did they find you? Do they indulge your reading habit or, like Smokey, do they let you know when enough is enough? What are some of your favorite furry characters from the books you've read? I'll randomly choose one person leaving a comment to win a book from my prize stash! Good morning, PJ! I just love that picture of Rachel. My best (and now, only) fur friend is Roxy. 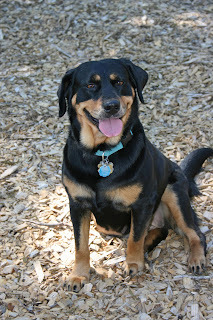 She's a rottie X and has the biggest personality of any dog I've ever owned. I've never seen a dog snore and dream like her and like your Smokey, she lets me know when she wants something. She's not a barker, but if I ignore her more subtle hints, she'll get up in my face and yell. Her best friend is Smudge, a Siamese X cat who barely tolerates us humans (we can't even pick her up), but she'll pester Roxy until Roxy grooms her and loves on her. Morning, Cinthia! Your Roxy sounds a lot like my Rachel who also snores and has the most interesting dreams. At least, I assume they are interesting. She sure looks like they are! lol! I'm amazed at the bond between Smudge and Roxy. I've never known a Siamese that was on friendly terms with anyone, let alone a dog! Hello, Ladies! I just adopted a five-week-old kitten and named her Sophie. It has been a long time since I've had a pet and I am totally in love! I lost my two dogs within six months of one another about 7 years ago, As my mean neighbor put it, they had just reached their "shelf life." I had a toy poodle named Suzi and a golden retriever named Sarah. I loved those babies. My Suzi was literally attached to my hip and my Sarah was my love. All I had to do was smile at her and she would come over, put her head in my lap, look into my eyes and sigh. My heart would melt. Our pets are our babies and they love us unconditionally. Love doesn't get any purer than that. Congratulations on adopting Sophie! They do steal our hearts, don't they? Suzi and Sarah sound like wonderful dogs. I'm sure you have many happy memories of your years together as I have of the wonderful dogs who shared my life before crossing the Rainbow Bridge. Oh, and "Boo Hiss" to your mean neighbor! I've been so busy just holding her that I can't seem to get much done. Pathetic, huh? But, pics are coming your way! Miss you, Leah! The photo of Rachel on the right looks so similar to the dog I rescued. Small, black and gold and a handsome face. We named home Bogie and he is a joy, a delight and a special dog who brings us happiness. He is fearless and an explorer and adventurer. What a smart, sensitive and intuitive dog he is. Unique and a loving companion. Bogie sounds like a treasure! I have an adorable Maltese, Guido, who has a wonderful disposition and looks arrogant and behaves in an independent manner but is soft, fluffy and sweet. He follows me from room to room and is always there making sure I am within his sight. Many have approached me when we walk since he is lovely. Being a lap dog he does enjoy walks but hates the heat and cold. He is so friendly to all which does worry me. We call him royalty when he acts snobbish. My favorite furry from a book would be Chet. Smart, capable and productive. Guido! What an awesome name and he sounds like a wonderful fur friend. We have two cats that we adopted from the local SPCA four years ago. The are named Curious and Liberty and I definitely spoil them since my kids are grown and in college. Curious is in trouble all the time and often wants you attention when you are trying to read. Liberty is quieter but will quietly show up when he wants attention. What cool names! I'm curious how you came up with Curious and Liberty. Sounds like they keep you on your toes. Aren't Goldens wonderful? They have such sweet dispositions. I'm so sorry you weren't able to take yours with you when you moved. I've loved all my dogs - our first was a mutt, not sure what the mix was but she was added to the family months before I came. So for 15 years, she and I grew up together. We then had a Shih Tzu who was the typical lap dog. She would stay in whatever position you put her in. Then came Sheba, my Siberian Husky I rescued from the pound. We swear she was raised with a cat. She had so much personality on her. I never thought I would have another dog because my husband swore he would never have pets. My daughter wore him down. Now we have Waffles, a Malshi and two parakeets. Suzy, I think all of my dogs could qualify for mutt status to some degree. Mutts make great friends! Forgot to add that I'm glad your friend is okay! Oh, I could go on forever about my many pets. 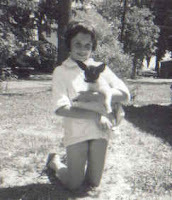 Our first was a beagle, Lucy, that we got down south when my husband was in in the SeaBees. She kept me company when he was gone and was our baby since we didn't have kids for 15 years. When she passed I said no more pets but my husband came home with a rescue that was the sweetest dog ever. My kids learned to stand by grabbing her fur and she never complained. We had her for 17 wonderful years. While we still had her some feral/stray cats came into my life and she kindly watched over them. I have taken care of cats for 20 yrs. now - so many I have found homes for, fixed and cared for and loved and lost. My favorite (I know but I couldn't help it) was a 6 wk. old kitten left on my doorstep by her mama covered in motor oil. I fed him with a baby doll bottle and he turned out to be my biggest alpha male. At the moment I have only 5 inside with 3 being given to me by my daughter at various times. My oldest is 15 and youngest 2. I still have two 15 yr. old females that I had fixed and stay outdoors along with various tom cats that come and go. I can't imagine ever living without them. It's hard to lose our pets. They own such a huge part of our hearts. I'm glad your husband brought home that rescue dog. Sounds like she was very special. I love the story of her helping your kids learn to stand! I am without a dog right now--one of only two periods in my adult life. We lost our beloved Suzie last October, after she'd been with us for 17 years. It's taken me a while, but I am almost ready to bring a new dog into our family. (((Hugs))) I'm so sorry you lost your Suzie. It does take time to grieve before our hearts are ready to open to another pet. You'll know when you're ready. What beautiful furry friends. I've always wanted a dog and I hope to one day be in the position to have one to care for. I do know exactly where I would look for one and that would be my local rescue organization as well. There are so many animals there in need of a loving home. I'm so glad you found Rachel who looks as sweet and cuddly as you've described! In my family everyday we feed the birds in our backyard. They are not our pets but I like to think the same ones return. We've been doing it for years and it's a treat to see them flying in. Na, there will be a wonderful dog waiting for you at your local rescue when you're ready to take the plunge! We didn't have any pets growing up and the only pets I've had since are fish. My cousin had a cat, but then my aunt gave it away. I tried fish the first year I was married. It was not pretty. What a great post! It definitely made me smile. I don't have fur friends, I have fur babies. I'm at the age where everyone bugs me about having kids, but I say.. I already have kids, they're just four legged! I love them to death and they are spoiled rotten, but they are truly my babies :) In fact, my avatar is Sammie when he was 4 month old. He's the youngest and is the "baby" of the family. Of the 3 dogs, he's the most spoiled and he knows it! Cassy, Rachel and I are glad we made you smile! Love Sammie's photo! Your first paragraph described me and my first pet. He was a Siamese and my mother got him when I was four months old. We grew up together and he was my world, just as I was his. Scooter could sense when something was wrong with me, no matter where he was at, and would come to me and comfort me when I was sad. He would lick the tears from my face. I have tears in my eyes as I write this. I have never gotten over the loss of him. He would let me dress him up in my baby's clothes and cover him up and stroll him around in my baby doll carriage when I was younger and as we grew together, the bond only grew stronger. When we were 18, my dad and I decided it was time to let him go. He was blind, deaf, couldn't eat well, and was loosing his hair. That had to be the hardest thing I have ever done in my life, and the most selfless. I know he is waiting for me on the other side. I now have a dog, Sweetpea, and two cats, Emory (who thinks he is a dog and weighs around 23 lbs.) and Ceaser. They are each quirky in their own way but that makes them that much more special. I am so thankful that they found me, for that is how I see it. All three are rescues. Thank you for sharing this with us. Life sure would be lacking without our furry friends! I love my fur babies. I have 2 dogs, 2 cats, and 1 bird. 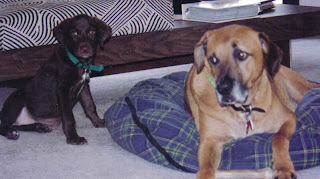 Both of my dogs were abused/neglected before I adopted them (well, I actually think they adopted me instead). One of my cats I have had his whole life, the other just came to me this summer after my great-grandmother passed away. My bird (a cockatiel) was from a pretty neglected home too, the man owned lots of birds and raised them to sell, but they did not get a lot of interaction). Although they can drive me crazy sometimes (for some reason I can hardly ever get all the furry ones to eat at the same time, they leave toys scattered all over the house & yard like a houseful of toddlers, and loud noises scare the crap out of them--July 4th is NOT a good holiday for them), they are my buddies and I don't even want to imagine not having them. I don't plan on any more cats though, I have developed an allergy to them. Luckily it just makes me itch (skin, throat, eyes, etc) but only rarely interferes with my asthma. PJ, I remember when you first posted about your fur friends, past and present. So nice to see beautiful Rachel as the newbie. I have had some wonderful fur friends over the years, both canine and feline. At the moment I am so grateful to be celebrating 21 years with my gorgeous Burmilla cat Albert, now known as Ancient Albert. I found him and his sister Kira (who lived to 18 years) in a newspaper advertisement while I was living in London, England. When I went to see them, Albert chose me from a litter of exquisite kittens, just jumped up on my lap then followed me to the door. How could I resist? I transported him and his sister to Australia when the time came for us to return. He has a beautiful, loving nature and has been a part of my life for so long--needless to say we adore him! I have four wonderful kitty fur babies who I spoil like crazy! Calvin and Hobbes are both 10 years old now, and still causing as much trouble as their names suggest. Frosty makes me laugh because he is clumsiest kitty ever, and is always falling off the bed. And Cleo, despite being half the size of the 3 boys, still bosses them around all the time, and they let her! My parents quite happily tell people that they have 4 grand-cats! Aww! Thank you for sharing this with us again, PJ; especially since I did not get a chance to see it the first time around. We have never been able to have pets (except for the occasional gold fish) because of my allergies. I know they say that there are dogs that people with allergies can live with without problems. Unfortunately, I have never been able to find one. So I have had to make do with pets belonging to friends. I get to play and cuddle them for a short time before I have to go home and shower all the dander off and take my allergy meds. Anyway, I always love books with dogs in them. Jennifer Crusie comes to mind; she always has dogs and sometimes a cat in her books. My favorite is "Bet Me" starring her giant, ugly, orange stray cat. Eloisa James has great tiny dogs in her first fairytale book, "A Kiss at Midnight," and many of her other books; I love them, all! Then there is Linda Francis Lee's Einstein in "Emily and Einstein," Even though he is really her louse of a husband reincarnated; he does redeem himself. Finally, I have to say my favorite is "Albert" in Lisa Kleypas' wonderful novel LOVE IN THE AFTERNOON, who with his master, Christopher, suffers from Post Traumatic Stress Disorder. So many books with pets, so little time! We have recently been adopted by some wild life. A very feral cat & a possum. They do NOT like each other at all & the fur literally flies. This 'disagreement' generally takes place, late at night, on our roof. I'm furry frendless at the moment. But an author who never fails to make me smile with her furry friends is Susan Donovan! We have 3 furry friend (children) dogs. They are spoiled rotten and think they are people. We found all 3 of them (one from a shelter). We have an 8 year old Toy Fox Terrier, 7 year old Blue Merle/Bull Dog, and a 5 year old Yorkie/Chihuahua. They sleep with us and sit in our chairs with us. They keep our spirits up during bad times and love us unconditionally. At bedtime, they let you know they want to go to bed, and when I try to read at night, I usually have a lap full trying to cover my book. We would be lost without them. In the 38 years we hav been married, we have had a total of 7 furry friends and they all have been our children.